The New York Times best-selling book Heaven is for Real by Nebraska Pastor Todd Burpo opens on the big screen this coming Wednesday before Easter. 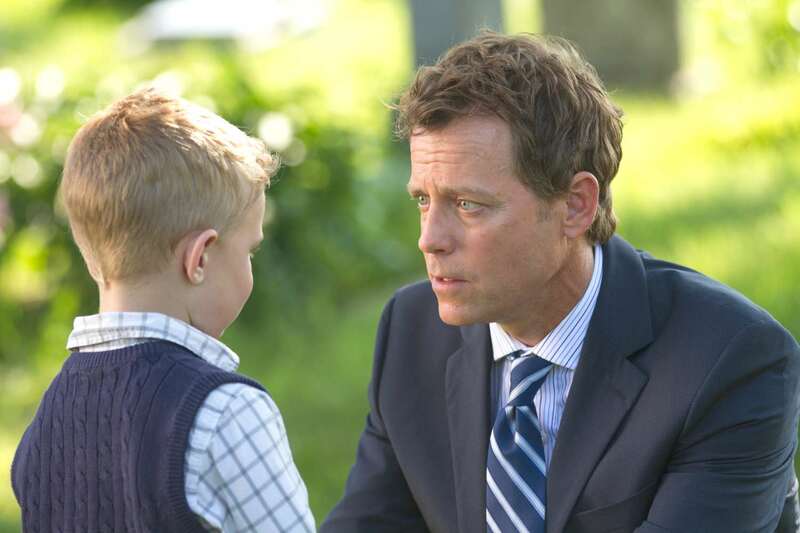 Oscar nominee Greg Kinnear stars as pastor Todd Burpo whose four-year-old, angelic looking son, Colton (Connor Corum), claims to have visited heaven during a near-death experience. How does the film measure up to the book? I can’t tell you that, as I haven’t read the book, but I can tell you the film is worth seeing for it’s family centered themes, realistic performances and breathtaking cinematography. In short, the film stands on its own merit. After surviving a burst appendix at age four, Colton tells his dad that during his surgery he rose above his hospital bed and saw he and his mom in separate rooms of the hospital. He also said that he went to heaven where he met Jesus, saw singing angels and met relatives that he’s never met before (his grandfather and his sister who died in his mother’s womb). The film explores the family’s courage to share their son’s astonishing experience with the world, while providing the raw emotions that occurred during this time. The event happened in 2003 when Colton was two months shy of his four-year-old birthday. He told his parents about his visit to heaven several months after his recovery. As pastor of the Crossroads Wesleyan Church in Imperial, Nebraska, Burpo made the decision to go public with the story and began telling his church parishioners of Colton’s story. His book was published in 2010. Kelly Reilly (Sherlock Holmes, 2009) co-stars as Sonja Burpo, a loving wife, church choir director and devoted mother. She worries about her family’s finances as the bills keep piling up and Todd’s garage door repair business receives payments in the form of ‘in kind’ by some of his clients. Pastor Burpo is a member of the volunteer fire department and he coaches the high school wrestling team, which is somewhat typical for a small town as people usually help out in many different arenas. He’s having an unusually bad year as he breaks his leg during a baseball game and has a severely painful case of kidney stones. His stress levels are at the brink due to the families mounting bills and his friend, local banker (Thomas Haden Church) and church board member, can’t convince him to accept a loan. The real Midwest family that is portrayed here is somewhat typical of family life of today. Viewers will identify with this young family’s struggle to keep afloat and maintain optimistic decorum during such difficult financial times. Fortunately, we are privy to how the couple upholds passion, faith and courage in their marriage. An interesting occurrence happens when Todd begins to believe Colton’s spiritual escapade. He begins questioning his own faith and starts searching for answers, even to the extent of visiting a psychology professor for scientific answers. What we do eventually see is Todd’s undeniable faith in his son’s story, but more doubts and problems occur when he begins preaching about the event in church. Several church members become concerned that their community will become a circus once word gets out to the media. Others are worried that their church may be taking on too much. Margo Martindale (August: Osage County, 2013) gives a memorable performance as a church board member and a mother suffering quietly from the death of her military son. She proposes that their church might need to find a new minister. Director Randall Wallace of Dances with Wolves (1990) fame, shares screenplay credit with Chris Parker. The chemistry between Kinnear and his film wife, Reilly helps the film tremendously. Their performances are believable and moving. Connor Corum is perfectly cast as Colton; he’s a bright-eyed natural who just may steal your heart. The script stumbles a few times and is a bit too wordy, but the strong acting makes up for it. This is a feel-good family film that just may cause you to shed a tear or two−mainly because of the emotional topics that are presented. What I especially appreciated was that fact that ‘Heaven’ is not preachy; plain and simple it’s one family’s incredible account. It makes no claims, nor tries to steer you in one direction or the other. In the end, the choice to believe is yours. Bottom-Line? This is a relevant, suitable family film for the approaching Easter holiday with a strong believable cast and beautiful cinematography. I’d say middle school-age children should be fine with the film. Spider-Man in Chicago for Earth Hour 2014!